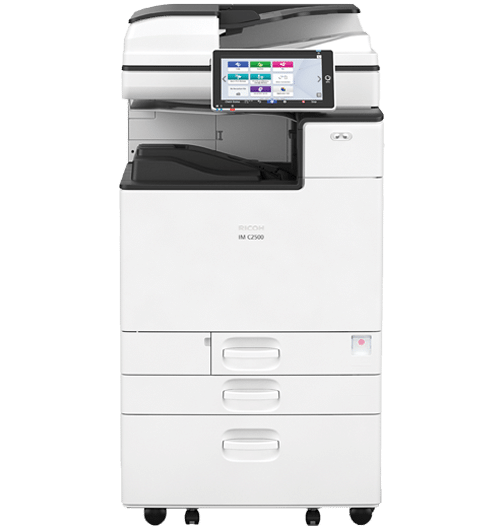 The Ricoh IM C2500 Color Laser Multifunction Printer not only comes with smart features, but it’s also scalable for all of your workflow needs. This copier produces 25 pages per minute, whether you’re printing color or black-and-white documents. This copier has the capability to download updated software at any time. Ricoh stays on track with the best technology available. With this copier, you are able to produce presentations, brochures, postcards and more with 1200 x 1200 dpi resolution without compromising speed, quality or options. You can print on paper sizes up to 12″ x 18″, even on thicker paper stocks. Ricoh makes it possible for you to reduce maintenance and improve uptime and work speeds by providing Intelligent Support. The touch screen allows for you to add widgets and applications that work just for your business. The touch screen tablet is Andriod based and lets you preview documents before you print or copy to help reduce copying costs if you’re not happy with a design.